Previously I had 2 24″ monitor setup but I found that I was constantly alt-tabbing to view other windows. Now you may ask, how can you even use 4 monitors. Well, when I develop or design I have one screen for the editor or photoshop, one screen for the specifications, one screen for the FTP program, and another screen for the browser to view my work. Dual monitors did help a lot, but it only reduced my alt-tabbing in half. Now with the four screens I rarely alt tab to other programs. Multiple monitor setups have a lot of advantages. It definitely increases productivity. Having everything displayed in front of you at once helps you keep your place, where you would normally lose it having to tab through screens. Multiple monitors makes it so that you can easily remote in to multiple computers and servers and perform actions and you can monitor the progress from the corner of your eye. I am frequently moving large files over multiple servers and I work with a lot of security conscious clients who have me remote to a desktop within their network to perform changes. Lastly, the quad monitor setup just looks really cool. 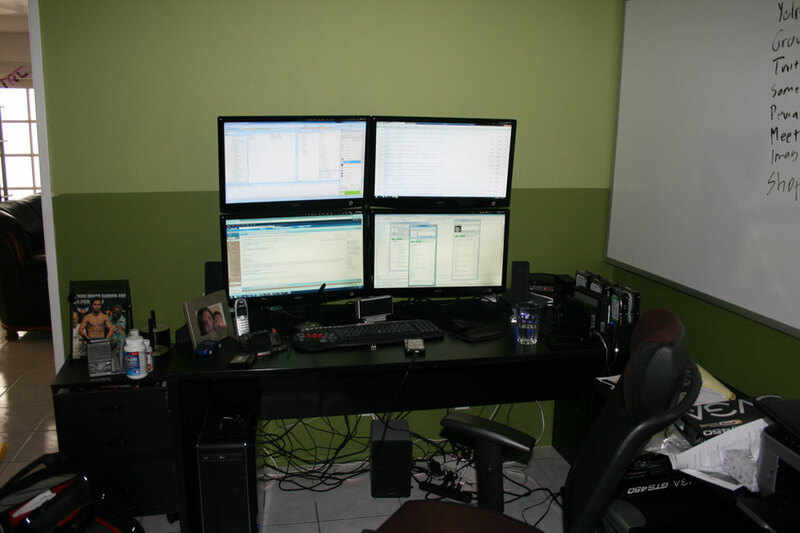 Ever since I saw The Matrix I wanted to have the multiple monitor setup. Working on any other setup just seems like a waste of time.